Over the past few years, I have really come to love Mother’s Day. When we were growing up, the holiday was always full of homemade cards, small gifts, and re-affirmed love. But ever since my mother’s mother died many years back, I have started to realize the importance of personal love and attention on this day. I am so blessed that my mother, my mother’s sister, and my mother-in-law all live in town. Without even intending to, we have created a few Mother’s Day traditions that I hope last forever. My cousin Emily is pretty much like my sister. We grew up in the same neighborhood and continue to be best friends. 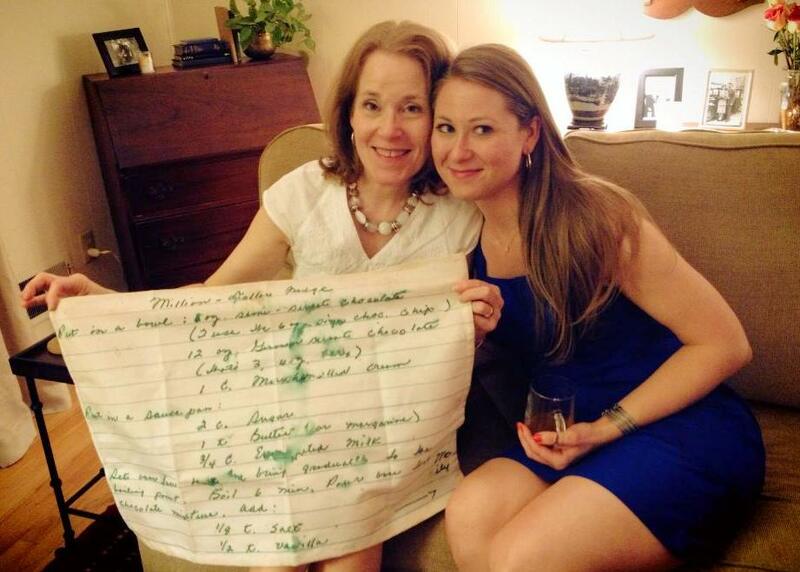 Together we have found super special ways to celebrate Mother’s Day for our moms. This year we pulled off a very personal gift for them. We created handmade dish towels that are custom-printed with our grandmother’s handwritten recipe cards. We knew this would be a tear jerker, and were able to give them the gift with my grandfather present! Here is a picture of the final product, and am going to write a whole post about the process tomorrow. Make sure you stop by tomorrow for this goodie! Every year my husband and I also have both our mothers and families over to our house for Mother’s Day brunch. I wrote a little about that here, and had great plans for this year’s brunch! I was able to expand my normal decorating and cooking agenda and it turned out well. I wasn’t able to adopt a coral theme like I wanted (because I had to work around a red tablecloth), but I added several new recipes and added a serving table which opened up the dining room. I confess I got very few pictures, but here is a little idea of what our day looked like! (About this coffee cake, I have never tasted better! It was moist – thanks to the yogurt – and so AMAZING. I ate it for breakfast the next day. You must try it! 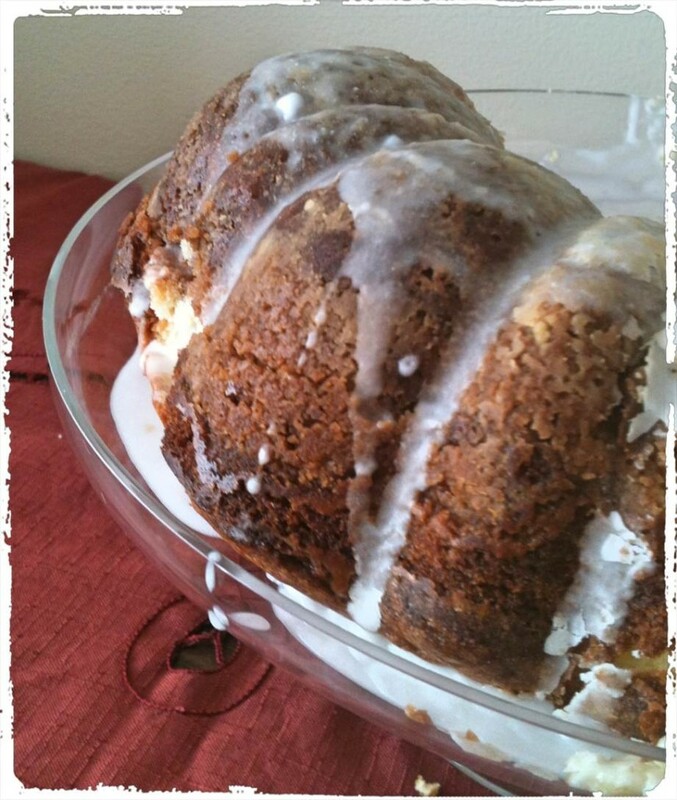 This moist bundt cake is melt-in-your-mouth! The key is the vanilla yogurt. Plain also works – but vanilla makes all the difference. Full recipe credit goes to this site. For the Streusel Topping, mix flour, brown sugar and cinnamon in medium bowl. Cut in cold butter with pastry blender or 2 knives until mixture resembles coarse crumbs. For the Cake, beat softened butter, granulated sugar and yogurt in large bowl with electric mixer on medium speed until light and fluffy. Mix in vanilla. Gradually beat in flour and baking soda on low speed until well mixed. Spoon 1/2 of the Streusel Topping into greased and floured 12-cup Bundt pan. Spoon 1/2 of the batter over top. Repeat layers. Cool in pan 10 minutes. Remove from pan. Cool completely on wire rack. Sprinkle with confectioners’ sugar or drizzle with Vanilla Glaze, if desired.